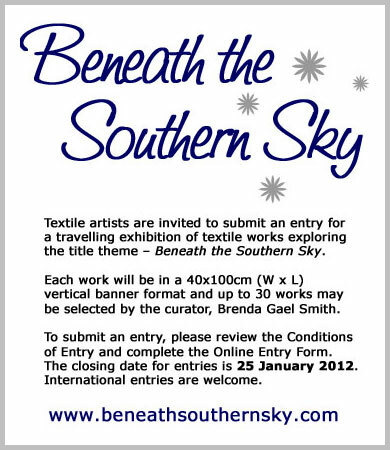 Here is an exciting new opportunity for textile artists to participate in a new travelling exhibition - Beneath the Southern Sky. Entries close on 25 January 2012. 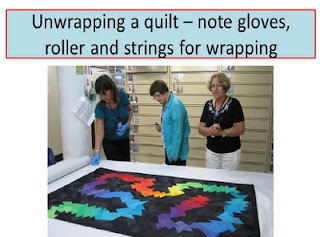 The meeting was held to report on the progress of the help that four committee members of the Quilt Study Group (Karen Fail, Annette Gero, Sandra Lyons and Liz Bonner) have been giving the textile area of the Powerhouse Museum with research and documentation of their quilts. In late 2010, we met Christina Sumner, the Principal Curator, Design and Society, to discuss how we could help the Museum with its quilt collection. Due to staff cutbacks, there was a need to improve the documentation of the quilt collection and volunteers were needed to supplement the work of that area, as they had already done in a previous project to document the Museum’s rug collection. Christina was delighted to accept our offer of assistance. After we discussed how to best approach the work and learnt how to fill in the form to make it easy for Christina to upload the information to the Museum’s computer system, we then chose our quilts to study and document from a file of possible contenders that Christina had selected. Annette chose a patchwork quilt (98/48/1) made from military uniforms that was similar to one in her collection. 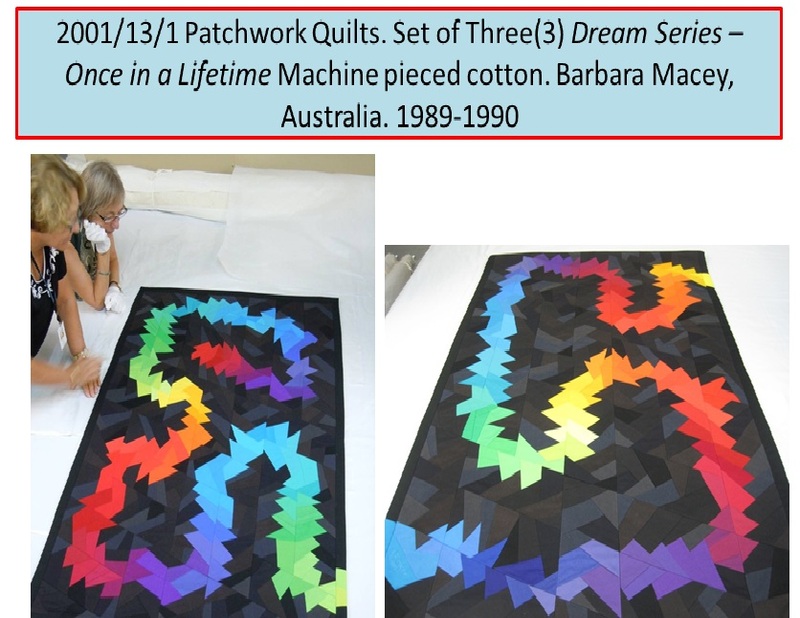 Karen chose a set of 3 quilts (2001/13/1) by Barbara Macey called ‘Dream Series – Once in a Lifetime”. Sandra chose a woollen machine-pieced, hand embroidered quilt (96/393/1) made by Jocelyn Campbell. 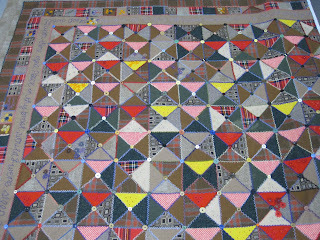 And Liz Bonner initially chose an undocumented North England whole cloth quilt (A8645) made by Hannah Coulson but after discovering on the National Quilt Register that 2 other quilts made by Hannah had also been donated to the museum, decided to research and document all 3 of Hannah’s quilts. In February 2011 we visited the Museum’s quilt storage area with Christina Sumner to view our chosen quilts and then our hard work of research and documentation started. Karen Fail ran the audience through the Powerhouse Museum’s online quilt collection catalogue, then showed the documentation requirements – the form used - and explained in detail the different sections we have to complete. Annette started the quilt presentations proper by showing photos of her military quilt and the one she has researched for the Powerhouse Museum. 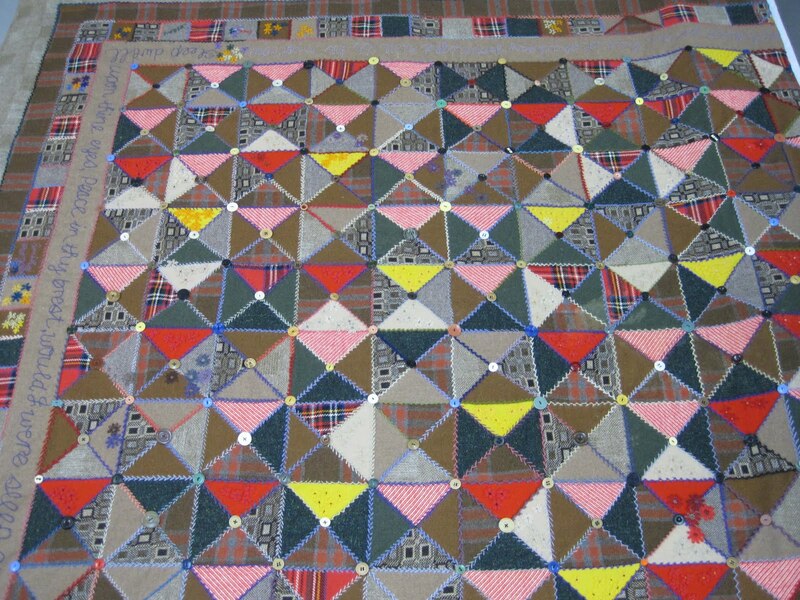 The Powerhouse army quilt is supposed to have been made in Tasmania from war army uniforms from the British 90th Regiment of Foot c1870 by the soldiers’ wives. The connection was made because some soldiers who fought in the Crimean war were then given land grants in Tasmania in the 1860s. The quilt is hand stitched from trousers and jackets but analysis, by Annette and a military historian, suggests it was probably made in England and brought here as it is also all made by "one hand". Comparison photographs of the 2 quilts were shown and discussed. Liz then talked about the 2 whole cloth and 1 strippy North England quilts made by Hannah Coulson (1826-1903) which were brought to Australia in 1912 by her daughter, Ruth Ritson, and which were donated to the Museum by her granddaughter, Lavinia McFadyen in the late 1980s. The town of Allendale in Northumberland, England, is famous for the design of North England whole cloth quilts and Hannah’s forebears lived in the area for generations as lead ore miners. After covering the important dates in Hannah’s life (researched from various genealogical websites) and the story of how the quilts were brought to Australia, Liz then covered the general characteristics of North England quilts and how they specifically relate to each of Hannah’s quilts. 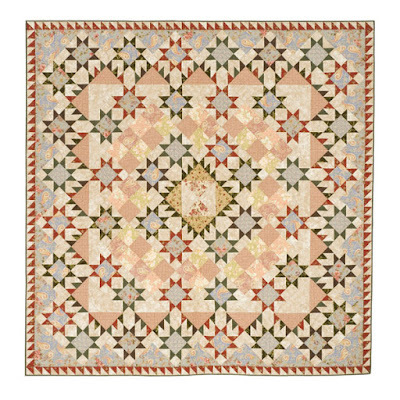 One of the quilts, A8645, was only the third quilt in the museum’s collection and is quite a spectacular example of the fine design and quilting of this type. From Lavinia’s letters that accompanied the quilt donations, it appears there are more of Hannah’s quilts in Australia, possibly in the Inverell district of northern NSW, and initial enquiries there have resulted in the discovery of one pink and white strippy. But the most important wedding quilt Hannah made for her only son, John Reed, who died in Queensland in 1918, is yet to be found. Sandra then spoke about her research on the embroidered woollen quilt, made by Jocelyn Campbell in 1990. There is a large amount of information about the quilt on the Powerhouse Museum’s website so Sandra’s work mostly involved confirming those details. We inspected the detailed photographs of the quilt with great interest and, because she was able to talk to the quilt maker, Sandra was able to add to our knowledge of the quilt itself and Jocelyn’s later quilts. Then Karen spoke about Barbara Macey, her quilting process and her quilts. Barbara has been quilting for 40 years and was a recipient of the Rajah Award for outstanding service to the quilting community in 2010. We saw photographs of some of her major quilts and Karen spoke at length about her conversation with Barbara and her explanation of the techniques and choice of materials in her quilts. Kay Haerland presents Friday showcase at the Guild office at 10am on Friday, 1 July 2011. All welcome! ($5.50 entry fee). Twitchers all of a Twitter! Congratulations to Merelyn Pearce who was awarded Bernina Best of Show 2011 for her applique masterpiece, Preston Dreaming. 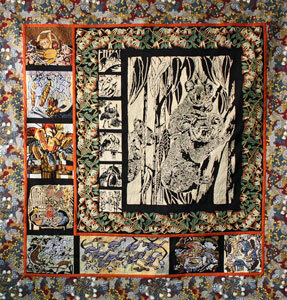 You can view Merelyn's quilt, along with images of other prize winning quilts at the 2011 Sydney Quilt Show Prize Winner's Gallery. In this final quilt,in the series of six, I have sought to highlight the influence of Australian Aboriginal Art on the work of Margaret Preston who strove to achieve a truly uniquely Australian artistic expression. Tickets ($2 each) available from the Membership Desk at the Sydney Quilt Show (22-26 June). The Quilters' Guild of NSW is proud to present its annual members' exhibition this week from 22-26 June in conjunction with the Craft & Quilt Fair at the Exhibition Centre at Darling Harbour, Sydney. This exciting event opens at 9am on Wednesday, 22 June and everyone is invited to attend the awards ceremony at the special time of 11am. Kids Skills on Saturday and Sunday. 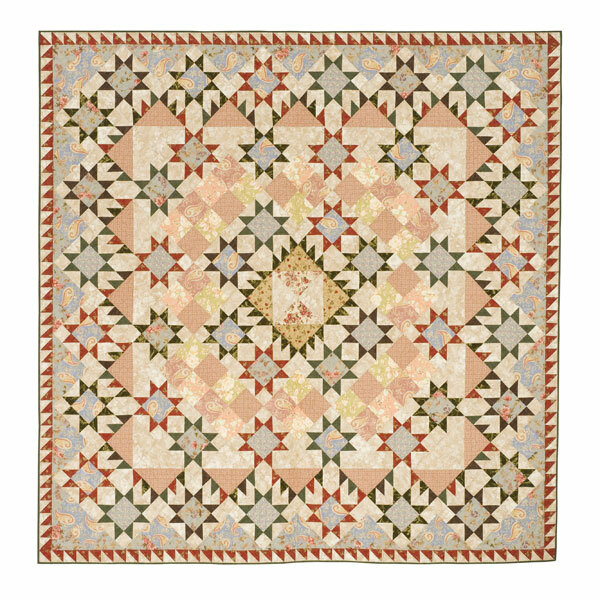 In addition, this year we are introducing a number of 30-minute floor talks on a variety of topics, using the quilts on display to illustrate the variety that's possible in quilt construction and design. Tours commence at the Best of Show quilt and are FREE of charge. See floor talk timetable below. 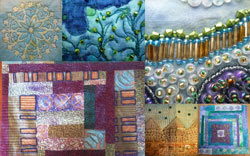 Note: The Guild office is closed during the week of the Sydney Quilt Show and will reopen at 10am on Monday 27 June 2011. We are delighted that Jennifer Sanders has agreed to curate this exhibition (formerly The New Quilt), which celebrates the 21st year of this contemporary quilt exhibition and The Quilters’ Guild of NSW’s 30th year. The exhibition will be based on the theme Regeneration. In her acceptance of curatorship, Jennifer Sanders stated that "Regeneration gives us the opportunity to encourage and foster new forms of quilted textile art – work which draws on the traditional skills and expertise and then explores new territories of expression on the exhibition theme. I am committed to engaging the audience in the stories behind the quilts." One of Jennifer Sanders’ proposals is the use of "individual display boxes for each work showing the artist’s sources of inspiration, photos, sketches; samples of their fabrics and techniques – any material which the artist believes will help convey to the audience the story behind the finished work." She believes that engaging the audience in the creative process and the stories behind the quilts will enhance their understanding and appreciation of the quilter's art. This indeed will be a new and exciting approach. Jennifer Sanders continued, "The ideas we are exploring to keep in dialogue with the selected artists as the works are made should help make the Regeneration exhibition project one in which the development process yields rewards for all involved as much as does the final exhibition in 2012." 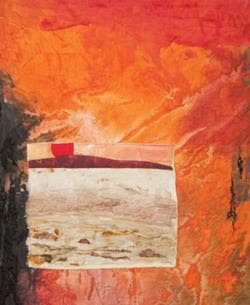 Regeneration, Contemporary Quilt Textiles 2012 will be held at Manly Art Gallery and Museum, 27 April to 4 June 2012. Full details and an entry form are available here. Applications close 25 July 2011. Darwin Patchworkers and Quilters Inc is hosting the Territory Quilts 2011 exhibition at the Darwin Performing Arts Centre from 28 July to 1 August 2011. Enjoy the fantastic weather in Darwin at this time of the year, meet other quilters and see wonderful quilts! Epping Creative Centre, Dence St, Epping. Download and return a Workshop Booking Form to reserve your place. Hurry - only three places left! Join Jewel Pearce Patterson Scholarship Winner and Guild Member Lisa Walton for a two-day masterclass exploring colour, textures and embellishments. Techniques such as fabric painting, stamping, rubbing, foiling and beading will be explored and combined with your own inspirational images. Students' work from this workshop may be selected for exhibition at the Houston International Quilt Festival 2011 as part of Lisa's Scholarship Exhibition. The DEADLINE is 15 August 2011.